AFB will be attending the Non-Canonical Podcast 75th Episode Live Recording! AFB is very excited to be taking a small part in the upcoming live recording of the 75th episode of the Non-Canonical Podcast! 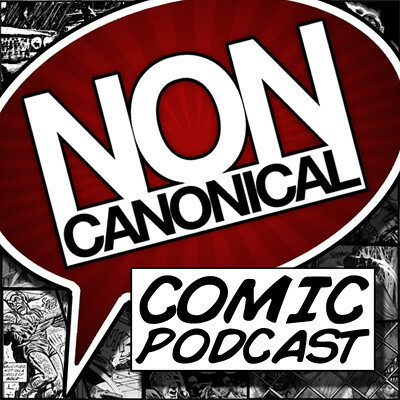 Non-Canonical is a weekly talkshow based out of Melbourne discussing the latest comic news and releases. It has a global audience and is relevant to anyone who loves the comic book industry and discussing the latest news and releases. Oh, and profanity - it helps if you are a fan of that too! Non-Canonical is the first stop for me each week in my podcast listening. I don’t always get through the episodes of some of the podcasts I subscribe to terribly quickly, but I never delay in listening to the latest Non-Canonical episode. Hosts Joe, Josh, Larry and Kane always make the discussion entertaining to listen to! On Saturday 17th September, two of my favourite Melbourne things are coming together - the Non-Canonical team and my amazing LCS, All Star Comics. Mitch and Troy from All Star will be hosting the live recording of the 75th Non-Canonical podcast at their shop at 410 Lonsdale Street in Melbourne’s CBD, and AFB will be there both as an audience member and to donate a great prize that the Non-Canonical team will give away during the recording! If you aren’t already listening to Non-Canonical, and you call yourself a comic book fan, you need to start! You can find them on iTunes and check out their website. If you’re a Melbournian, you might consider attending the live recording - the Facebook event page is here. AFB is delighted to be playing a small part in this great event!